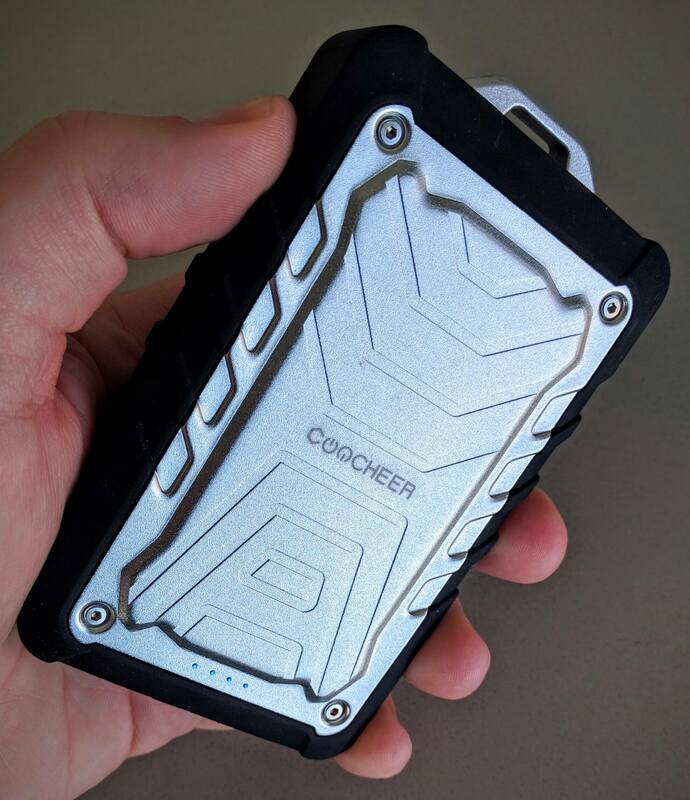 Overall I am quite pleased with the power and performance of the Coocheer CH-242 battery pack. It does a good job in a small, hardened package that withstand the tumbles of every day use be it at home, an airport or while on a hiking trip. The battery performance is good and charging times were more than acceptable. When it comes to external battery packs to charge your devices, the options are endless when it comes to size and performance. Many of these battery packs, however, are not necessarily hardened to withstand the elements. Enter the Coocheer Mobile Power pack CH-242. This 7500mAh pack has an aluminum chassis and body surrounded by a rubber edge. More importantly, the CH-242 has a rubber cover over its 2 USB ports to help keep water and dirt out while you are using it in the outdoors. While it certainly is not the most powerful pack you can get, for a price of just under $21, it is a great value. Here is my review. device are covered in a rubberized plastic. On one end of the pack is a lanyard look so you can connect it to your pack while on the opposite end you will find the small rubber door that pulls down to expose the USB ports. Next to that door is the frosted lens for the built-in flashlight of the pack. This is activated by pressing and holding the power button on the right side of the pack. On the top of the pack you will find 4 blue LEDs that light up when the pack is powered up to let you know how much battery charge is left on it. From a USB perspective, there are three ports on the CH-242. There is one MicroUSB port which is what you use to charge the pack. One of the USB Type-A ports is a 5v/1A while the second is a 5v/2.1A. Some will question while both ports are not 2.1A and it is a legitimate point. It would have been clearer if Coocheer had simply labeled both up to 2.1A but they, I think, are trying to be honest. Most dual-USB chargers will drop the ports down to 1A (or one of them) when you connect two devices. In the case of the CH-242, they are letting you know a head of time that one port is going to give you higher throughput than the other. The only inconvenience this will cause is if you are only charging one device and you want to get it charged as fast as possible. You have to remember to plug into the 2.4A port. This, frankly, is the only fault I can find with this product. Hopefully going forward they will redesign this to allow both ports to output 2.4A and indicate in the documentation that one drops to 1A when two devices are charging. That is what other manufactures do so it wouldn’t be out of line for Coocheer to do it either. Charging of my Nexus 6P from about 10% battery to 100% took roughly one hour and 15 minutes when it was the only device being charged. My Nexus 9 took a little longer at 1:35 minutes. This is a little longer than some other battery packs but certainly more than acceptable. The charging of these devices on the 1A port took considerably longer at just over 2 hours each. In all I was able to charge my 6P twice before I had to recharge the battery itself while I was able to get about 1 1/2 charges of the Nexus 9 before having to charge up the battery. Considering the battery in the CH-242 is a 7500mAh unit, this is well within what is expected from a performance perspective. When charging, even with two devices, the pack itself nor my phone or tablet got excessively hot in the process. The CH-242 is $19.99 on Amazon. You can get more information, including more reviews, on the Coocheer product page for the pack.